Criminals are getting more and more savvy, finding new ways to break into vehicles. The crimes like breaking and entering and vehicle theft. can happen to anyone, even a former lawman. A former sheriff in Michigan was victimized recently when a thief broke into his SUV parked outside his house and stole his handgun. According to reports, on the surveillance video, you can see a man walk up to the vehicle, with a device in his hand. He makes a motion with the device and the vehicle’s lights come on and the doors apparently unlock, before the thief even touches the car. The former sheriff believes some sort of computerized device was used to unlock his vehicle. Unfortunately, some criminals are using high tech devices to intercept the communication from key fobs and newer vehicles that are equipped with remote starters, push button starters and keyless entry. Armen Hareyan explains how the crime works in his story entitled "How Thieves Can Steal Your Tesla Model S in 10 Seconds - Shown in a Video". The remote starters have been especially vulnerable to crooks who use the devices to open the vehicles and then steal them. Often the crooks can’t get too far without the actual fob, but many get far enough to make it to a chop shop or a crooked repair shop that orders new remote fobs. 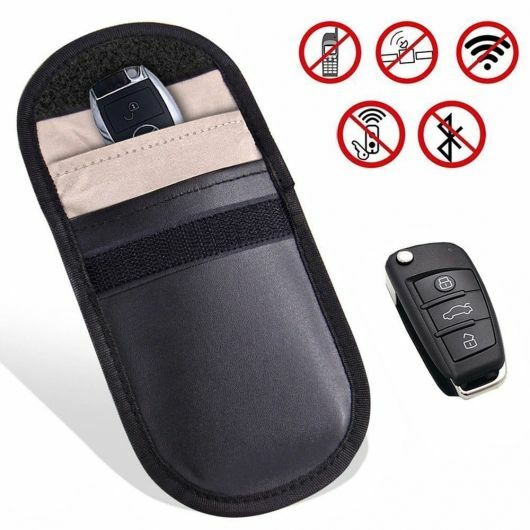 To make your car, truck or SUV less vulnerable to theft, security experts often recommend keeping your key fobs wrapped in what is called a Faraday bag.The bags are designed to block the radio frequency identifiers from being stolen. The remote key fobs send out radio waves and the bags block or shield them from transmitting. Some companies also sell wallets to prevent thieves from stealing your credit card numbers with small scanners. You can also keep your fobs in a tin can or wrap them in foil to prevent them from being intercepted by the bad guys. As more and more vehicles of all names plates are made with push button starts, keyless entry and remote starters, the problem will continue to grow. A number of different companies produce the wireless shielding devices or bags. For more information on the changing technology or recommendations, you can check www.safercar.gov. It is also important to remind everyone to take anything of value out of their car, truck or SUV. Weapons are especially dangerous because during a break-in, they end up in the criminals’ hands.